I recently had an opportunity to speak with Celebrity Nutritionist, Simone Gloger about the Dukan Diet. The Dukan Diet is a physician-formulated lifestyle / weight loss plan consisting of 4 phases that will help you reach and keep your True Weight for life. Within the 4 phases, you will not have to worry about counting calories and it is a low carb diet. Dukan Diet emphasizes on lean proteins, including an unrestricted amount of 100 healthy foods, drinking lots of water and daily walking. Upon reading The Dukan Diet: 2 Steps to Lose the Weight, 2 Steps to Keep It Off Forever , Gabe and I both decided to do this diet as our Wedding Diet. The four phases in the Dunkan Diet starts with the Attack Phase. This phase is also known as the Pure Protein (PP) phase. The sudden change in your eating habits triggers a fast and encouraging weight loss, which works to motivate you for the rest of your diet. I was very intrigued with this phase, because you are encouraged to eat as much lean proteins as possible. I asked Simone about how this worked and she informed me that protein is thermogentic. The more protein you eat, the more you calories you burn, causing you to lose more weight. This phase can last from two to seven days, where you eat 68 approved lean meats - all you can eat Filet Mignon, extra lean beef hot dogs, Duck, Sea Bass? Sign me up. The second phase of the Dukan Diet is the Cruise Phase which reintroduces vegetables and establishes the unlimited allowed foods as a base. This will steady your weight loss until you reach your true weight. The third phase of the Dukan Diet is the Consolidation Phase which will mark the end of the weight loss phase, while retaining the base of Proteins and Vegetables, plus a gradual reintroduction of starchier foods. The objective of the Dukan Diet Consolidation phase is to preserve and maintain your True Weight reached at the end of the Cruise phase. Finally, the fourth phase of the Dukan Diet is the Stabilization Phase which emphasizes the importance of Permanent Stabilization after your weight loss. Dukan Diets weight loss coaching program offers optional Stabilization Coaching after completion of coaching through the Consolidation phase. On the Dukan Diet, consuming Oat Bran is very important. It is eaten daily during all four phases. Oat Bran increases its absorptive qualities and creates a feeling of fullness. It binds with other foods in stomach which works as a calorie absorber. You can use Oat bran to can make pancakes, cookies, muffins, etc. 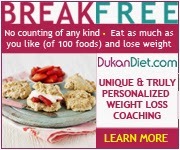 Follow Dukan Diet on Twitter and Facebook to learn more about their diet and products. 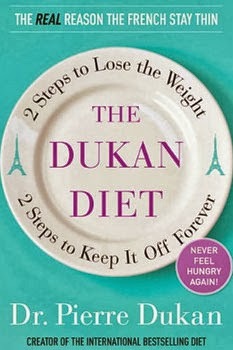 Disclosure: I was compensated for this review of the Dukan Diet. As always, all opinions are my own.